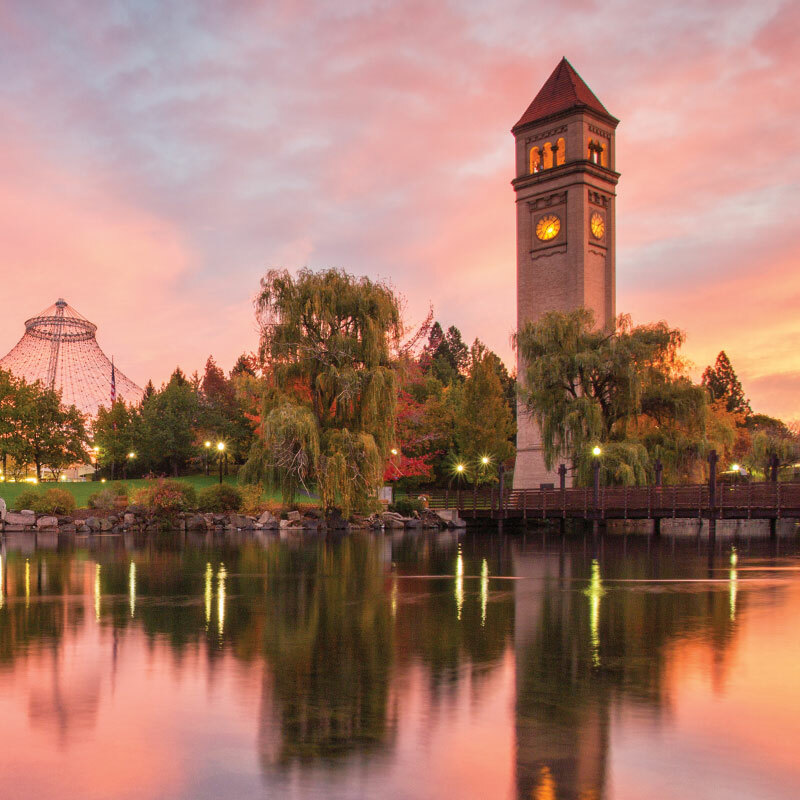 is The gateway to a delightful array of things to do, grand adventures to experience, and awesome sights to see, starting with the Spokane River which roars through the heart of the city. Riverfront Park frames the Spokane Falls. 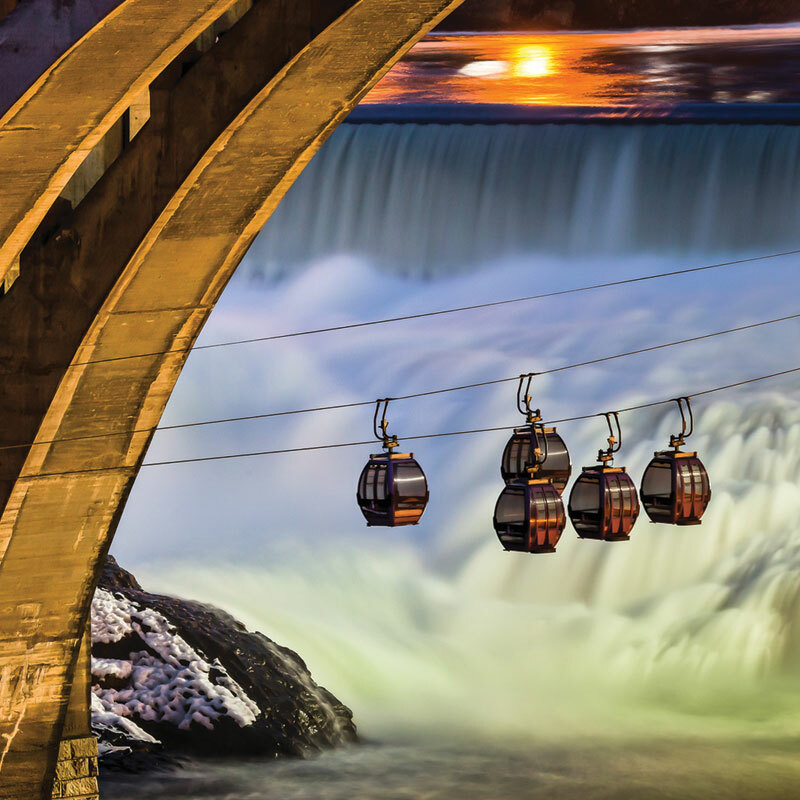 There is a system of walking bridges and trails that connect both sides of the river and provide exciting views of the falls and the city. The Great Northern Clock Tower and the classic Monroe Street Bridge frame the Park. The falls served as the centerpiece of the environmentally themed Expo 74 World’s Fair. When the Fair was over, the Park was transformed into a beautiful, lush area with trails leading to the upper and lower falls. A Sculpture Walk in the park includes fascinating bronzes. The Park is home to the classic 1909 Looff Carrousel and a giant replica of a child’s Radio Flyer wagon. 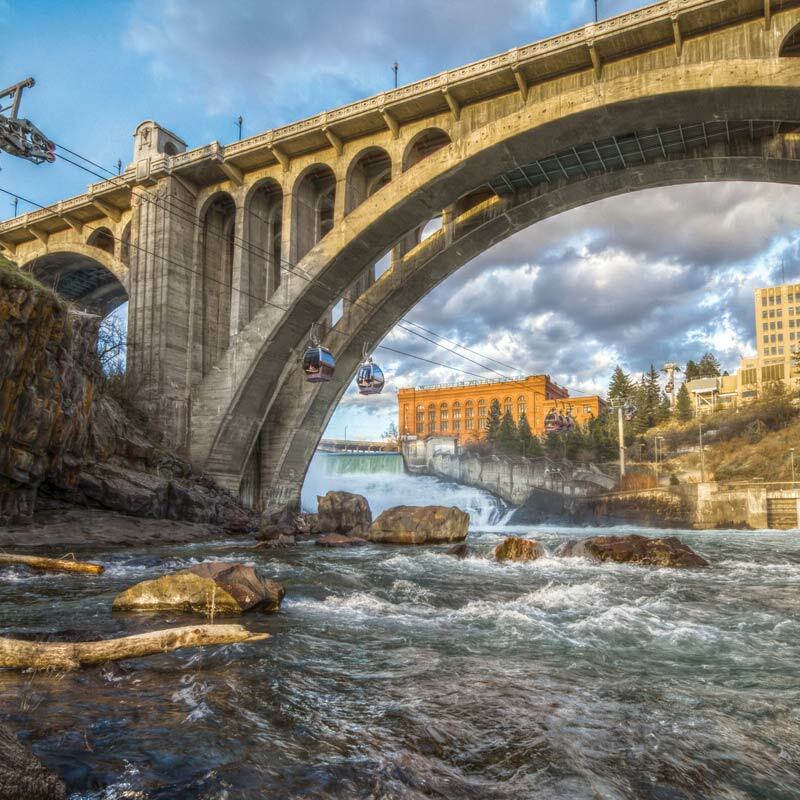 The Spokane Falls SkyRide provides great views of the falls and the city. The nearly 40-mile Spokane River Centennial State Park Trail follows the Little Spokane and Spokane Rivers through Spokane all the way to the Idaho border. The Trail links up with Riverfront Park, Riverside State Park, Lake Spokane, and Nine Mile Recreation Area. The combination of cascading waterfalls plus an array of outdoor recreation adventures in Riverside State Park, has established Spokane as one of the nation’s unique outdoor recreation destinations. Spokane’s definitive Near Nature. Near Perfect. drawing power is further enhanced by its varied cultural, entertainment, dining, sports events, and shopping venues. The INB Performing Arts Center and the Spokane Convention Center border Riverfront Park on Spokane Falls Boulevard. The Martin Woldson Theater at The Fox is home to the Spokane Symphony, and the INB Performing Arts Center presents Broadway shows throughout the year. The Spokane Veterans Memorial Arena hosts sports events. 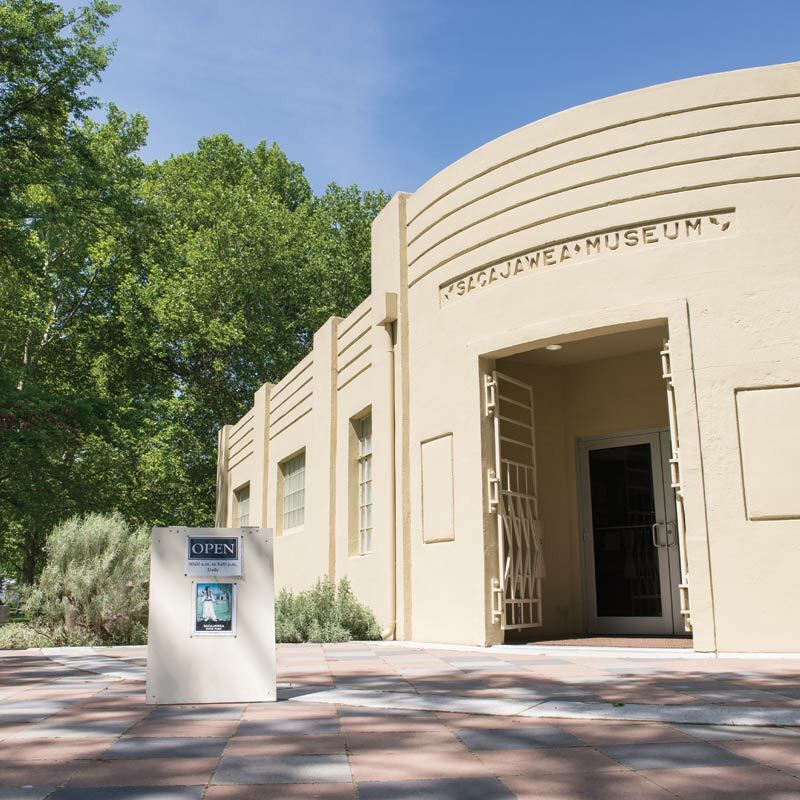 The Jundt Art Gallery, at Gonzaga University, the Chase Art Gallery in City Hall, and the Spokane Art District anchored by the Historic Davenport Hotel, and the NW Museum of Arts and Culture in the Browne’s Addition Historic District add to Spokane’s popularity. The short drive on SR206 leads to Washington’s largest state park. The drive to the top of the mountain provides sweeping vistas of surrounding states and Canada. The park has miles of hiking, mountain biking, and equestrian trails that can be enjoyed from the late spring to early fall. During winter the park receives more than 300 inches of snow. Mount Spokane State Park transforms into a wonderland offering downhill and Nordic skiing, snowshoeing, snowmobiling, and snowboarding. The forested slopes of Mount Spokane feature stands of old-growth trees and granite outcroppings. The park is home to moose, bear, bobcats, smaller wildlife and a variety of mountain birds. There are eight standard campsites and a larger group campsite. The Summit Road is open from mid-June through mid-October. The park is equipped with an automatic pay station to purchase a one-day or annual Discover Pass. During the winter season, from December 1– March 31, a Sno-Park permit is also required. The Pend Oreille Museum is a six-building complex that remembers the trappers, gold seekers, and lumbermen who made and lost fortunes in this rugged land. The complex includes a 1908 Depot and two log cabins. The nearby visitor center introduces visitors to all the fun things to see and do, including seeing a grazing herd of bison at Usk. You drive through Colville National Forest between Newport and Ione. People come from near and far to celebrate Down River Days. Just south of Ione is the Tiger Historical Center. North of Metaline Falls is Boundary Dam on the Pend Oreille River. There are spectacular viewscapes shaped by precipitous rock walls that descend to the lake and river. Crawford State Park Heritage Site is a day-use park with picnic tables for a family outing. The third largest limestone cavern in Washington. Group tours are limited to 25 people. Call Crawford State Park at 509-446-4065, or Mount Spokane State Park at 509-228- 4258 for more information. Seattle City Light offers a campground with standard campsites and restrooms, next to Boundary Dam, one mile outside of Crawford State Park. 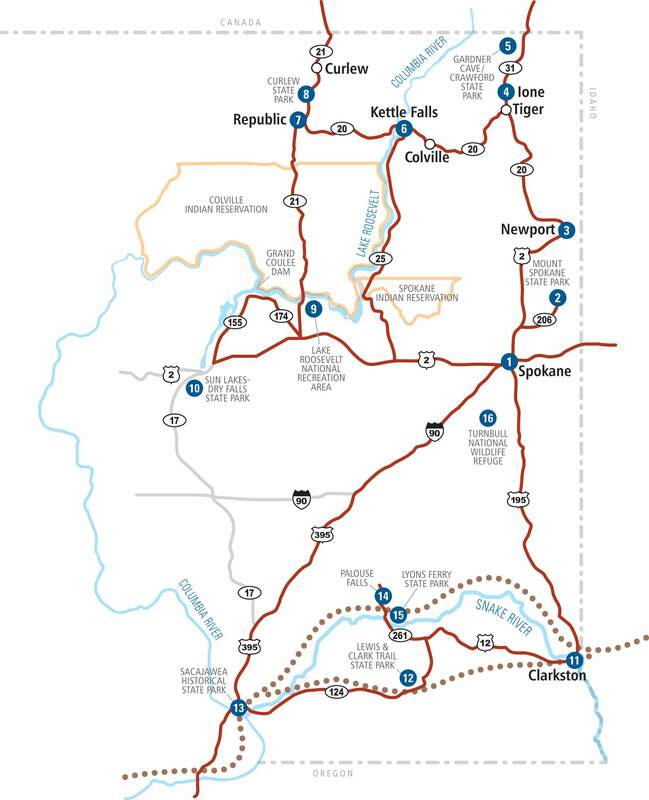 The Scenic Byway takes visitors to three National Forests through high mountain passes and scenic vistas. Crystal Falls, west of Tiger on the Little Pend Oreille River, is a delightful place to view the Crystal Falls from a roadside. Colville, west on SR 20 near Kettle Falls and the Columbia River is surrounded by forested mountains. Colville serves as a base for tours to nearby parks, waterfalls, and wildlife and fishing areas. It has a vintage shopping district and a variety of dining, shopping, and entertainment venues. The boarding site for vacationers wanting to take a houseboat vacation on the 130-mile-long Lake Roosevelt, created when the Grand Coulee Dam was built. Vacationers have amazing views of the Northern Cascade mountain range, including 5,577 foot Sherman Pass between Kettle Falls and Republic. are celebrated each year in mid-June. When you enter Republic you’ll pass by a small park that displays a 2,000 ounce “gold” nugget. More gold has been mined around Republic than in California and Alaska combined. And it is still being mined today. Republic is a remnant of the Old Frontier West where you can shop, dine, and kick up your heels. There are camping, picnic, boat launch and swimming sites. Another 25 miles north near the U.S. – Canadian border is Ranald McDonald’s Grave Site State Park Heritage Site, Washington’s smallest interpretive park. Further north on SR 21 is the town of Curlew. Its Anchorage Hotel Museum provides a close up look at Gold Rush days. Dry Falls State Park – is a 4,027 acre park below the dam with more than 73,640 feet of shoreline. Dry Falls was carved out during the Ice Age. At one time the falls were four times larger than Niagara Falls but now is a stark cliff more than 400-feet high and 3 ½ miles wide. The park has a visitor center and 152 standard campsites, 15 miles of hiking trails, two boat ramps and 680 feet of dock. Washington’s newly designated official state waterfall cascades 200 feet down a sheer rock cliff, then flows on to the Snake River. near Cheney off of I-90 is a unique marsh and timber ecosystem that attracts trumpeter and tundra swans, black terns, wild ducks, other waterfowl, as well as moose, whitetail and mule deer, beaver and river otters. Visitors can follow a seven-mile self-guided auto tour.